Tom Brown is an artist living in Calgary, AB, where he graduated from the Alberta College of Art & Design in 2015. Working primarily in handmade functional miniature, the focus of his practice is public engagement. 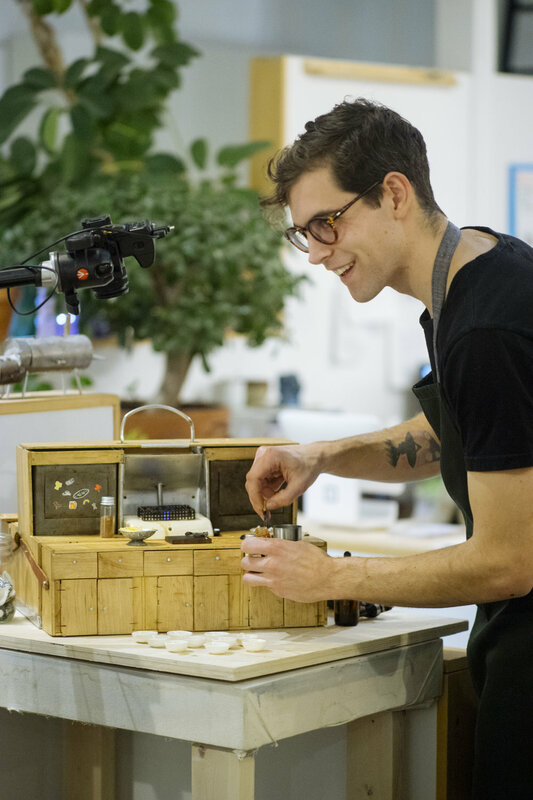 Beginning doing pop-up public performances in his fully functional piece Miniature Kitchen as a part of the larger project, Feeding the Masses, his methods of public engagement have evolved to encompass multiple additional projects. Finders Keepers features a handmade miniature, hidden each Saturday, for a member of the public to find. He has successfully hidden and had found over 140 items since this project’s 2017 inception. The items are hidden primarily in Calgary, but locations of successful hides include Spain, France, Japan, and a number of Canadian and American cities. His most recent project, Starting Small, is a collaborative initiative, utilizing his practice as a miniaturist to hand-make miniature skateboard decks which are then distributed to interested members of the public to paint, distribute further to their friends, and return to be catalogued and published. Since beginning this project in early 2019, he has distributed nearly 200 skateboards to people as far away as Turkey, Australia, and Sweden. Through these multiple facets, his interest remains rooted in creating portable art environments which are capable of activating social spaces, including public real world environments as well as virtual social spaces. There is a contrast in his work, however, as the formlessness of virtually published work seems to contradict the impulse behind the heavily process-based practice of creating handmade functional miniatures. This dichotomy is useful in creating compelling opportunities to move virtual interactions from the internet to the physical world, as in his projects Finders Keepers and Starting Small. Cultivating the internet as a display medium, while maintaining visual art as context, he hopes to continue to create new ways to interact with art.